This book studies the linguistic representation of events by examining the relevance of two salient event characteristics-- telicity and durativity-- to the grammatical system of natural language. The study of events, and of event characteristics, is an important testing ground for theories on the boundary between extralinguistic and linguistic knowledge, and on the relation between semantics and syntax. Telicity and durativity are notions which have become increasingly influential in both the semantic and the syntactic, i.e., grammaticalized, representation of events. 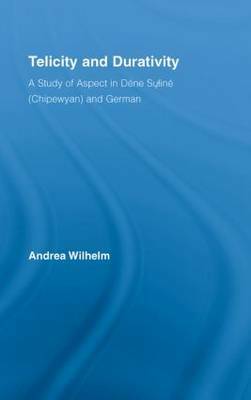 The book furthers the understanding of events through the comparison of two genetically and typologically distinct languages, German and Dene Suline (Chipewyan/Athapaskan), an indigenous language of Northwestern Canada. It contains the first in-depth documentation of the aspectual system of Dene Suline, and a careful analysis of the aspectual behaviour of German particle verbs. A stringent methodology considers semantic, pragmatic, and grammatical factors in both languages. The data reveal that telicity and durativity belong to profoundly different semantic and grammatical domains, and that neither notion is grammaticalized universally. While both notions are represented semantically in German as well as in Dene Suline, telicity is grammaticalized only in the former and durativity is grammaticalized only in the latter.